If you are one of those tens of thousands of Finnish hunters who don”?t know what to do with all that elk meat they”?ve shot this season, read ahead. If you are like me and didn”?t have the time to go hunting for the fifth year in a row, read ahead. If you just love venison, read ahead. Everybody else is also invited to enjoy the delicious texture and taste of elk! A couple of days ago when I went to my butcher-de-facto Reinin Liha to buy some beef, I saw these über-beautiful elk shanks. 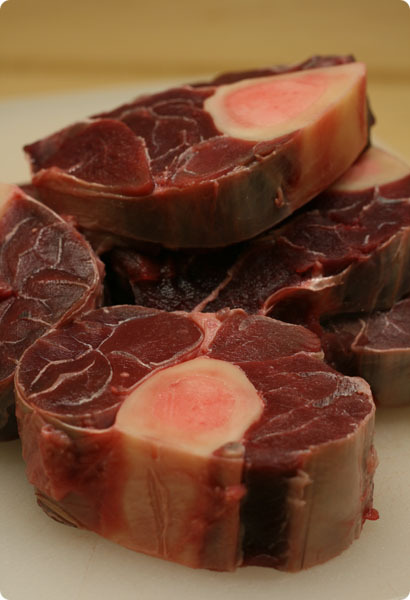 Osso Buco made from beef, calf or goat is one of my all-time favorite dishes. 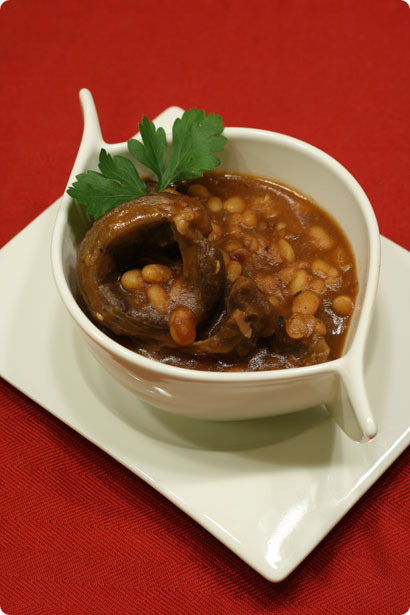 The rich, hearty and meaty taste of the broth from hours of slow simmering of the marrow bones is difficult to beat. So when I saw the elk shanks I immediately knew I had to buy them and cook some elk buco! Mix salt and pepper to the flour on a flat plate and cover the shanks evenly with flour. Heat butter and oil in a heavy casserole and brown the shanks from both sides. It”?s easier to do this in several batches. Chop the onions and add in the pot with the shanks. Cook for a while and add more salt and pepper to taste. Crush the juniper berries and add to the pot. Add the wine and beef broth and bring to boil. Set temperature to low and simmer for 3-4 hours until the meat is tender and falls of the bone. When the meat is done, remove from the pot and boil the broth until thick, and/or add brown Maizena until the broth is nice and thick. Add the meat back to the broth. For the gremolata, zest the lemon, chop the garlic and parsley until very fine and mix carefully. Sprinkle on top of the osso buco. Optional: Remove the bones but leave the marrow. Add two cans of beans in the broth and mix well. This way you don”?t necessarily need additional rice or potatoes but have a nice standalone dish. Mmmm, gremolataa! Meinaatko oikeesti ettet duunannut samalla luuytimell? maustettua risotto milanesea? Anna: risotto milanese olisi ollut ihan liian shishi-fufu t?lle ruualle! Sit? tein tosin pari viikkoa sitten perinteisen lehm?-bucon kanssa. Ytimet tuli kyll? imeskelty? huolellisesti putkiluista. Slurp! Oooh! I love osso buco…this is one of my mom’s specialties, but with beef. And now I make it too :) I wish I could have some with elk! I miss Finland!